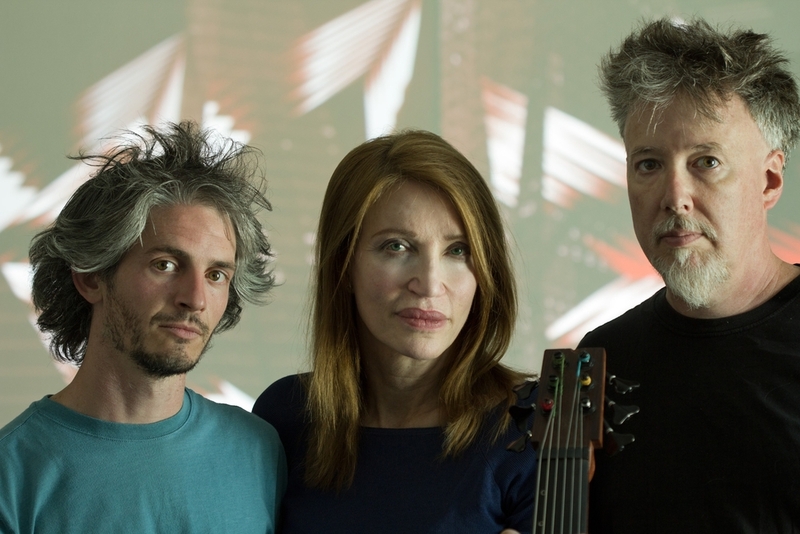 EMANATIONS joins NoiseFold with renowned cellist and visionary musician, Frances Marie Uitti. The work combines re-orchestrations of NoiseFold's seminal live cinema works, ALCHIMIA, and Neu_Blooms with newly created compositions developed in collaboration with Frances Marie Uitti. The visual images oscillate from fluid deformations of virtual objects to archetypal landscapes and speculative architectures. As in other NoiseFold works, the visual data is sonified to produce a rich pallet of electronic sound. The work is designed for multi-screen and multi-speaker configuration that provide opportunities for the trio to join in duets, perform solos or share data between the individual performers. Combining cinema, data sonification and acoustic music as an integral whole, NoiseFold and Uitti seek to extend network media performance into the realm of contemporary chamber music. "The spectacularly gifted cellist Frances-Marie Uitti has made a career out of demolishing musical boundaries. She has developed new techniques (most famously, playing with two bows simultaneously), collaborated with a who's who of contemporary composers, and pushed the cello into realms of unexpected beauty and expression.... Uitti showed why she might be the most interesting cellist on the planet."